Independent mobile advertising platform, InMobi, has announced its network growth numbers. InMobi now reaches 872 million active uniques spanning more than 200 countries, bringing a truly global audience for advertisers wanting to reach their target consumers. 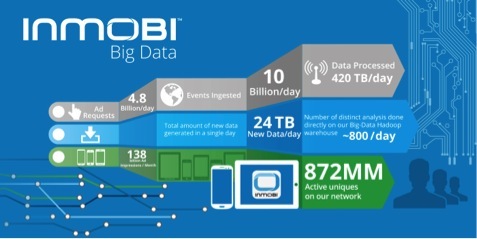 InMobi now serves nearly 138 billion ad impressions every month. Mobile brings an entirely new set of data and signals to marketers that allows them to do far more than they could in other media. These signals include consumers’ location, mobility, the weather and tactile elements. InMobi’s decision sciences enable creation of high-confidence Consumer Experience Profiles, which brings together a clear understanding of consumer preferences and how they vary across moments. For instance, InMobi Geo Context Targeting showed 2x CTRs on campaigns and comes with 651 million Points of Interest mapped across 50 countries. InMobi for Brands also has over 75 audience personas across 15 industry verticals. Mobile as a medium continues to take centre stage among brands and developers. Earlier this year, the InMobi Media Consumption Survey highlighted that consumers globally spend an average of almost 2.2 hours per day with mobile (97 minutes) and tablet (37 minutes) together, which account for a total 37% of media time, ahead of television (81 minutes), the desktop (70 minutes), print (33 minutes) and radio (44 minutes). As more users flock to this medium, InMobi has brought together the art and science of mobile advertising by helping brands connect to their potential consumers, as well as app developers discover new users. In a more recent update at the Advertising Week in New York, InMobi launched the InMobi Guaranteed Outcomes, which is an industry first offering where InMobi guarantees the desired outcomes for brands by meeting their Key Performance Indicators (KPIs). “Today, mobile advertising is all about catering to an ‘always-on’ user. As users begin to take decisions in real time, the concept of immediacy and moment marketing at that precise instance becomes critical to influence his decisions,” said Atul Satija, vice president for revenue & operations at InMobi.